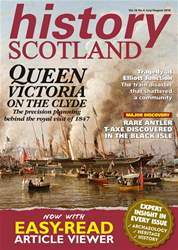 Digital Subscriptions > History Scotland > July - Aug 2018 > Who were the Jacobites and what did they want for Scotland? Professor Murray Pittock (University of Glasgow) and Professor Christopher Whatley (University of Dundee) debated the question ‘Who Were the Jacobites and what did they want for Scotland’, followed by a lively question and answer session chaired by Dr Andrew Mackillop (University of Glasgow). The event, which was held in partnership with the University of Dundee Centre for Scottish Culture, attracted more than 300 people. You can see a video of the full proceedings on our website: scot.sh/hslecture1 The next History Scotland lecture will be held on 30 August at the Highland Archive and Registration Centre in Inverness. Entry is free and you can find details and booking information on page 65.